Agilent Technologies have introduced the U1253A handheld digital multimeter (DMM) that uses an organic light-emitting diode (OLED) display. For on-the-go and benchtop applications, the OLED readout provides a 2000:1 contrast ratio, a 160-degree viewing angle, smoothed fonts and a ‘large display’ mode to ensure crystal-clear indoor viewing. 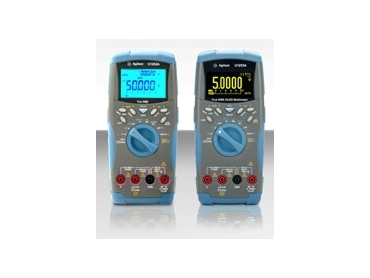 The U1253A handheld digital multimeter expands Agilent Technologies’ U1250 series of handheld DMMs. Designed to simplify electronic troubleshooting and validation, these high-performance instruments enable engineers and technicians to complete their day-to-day tasks without being confined to the bench. Precision: Key specifications are 4.5-digit resolution with 50,000-count full-scale dual display and basic accuracy of up to 0.025%. All offer simultaneous measurements and provide the flexibility to perform validation tests, tolerance checks and marginal-failure troubleshooting. Versatility: Beyond basic DMM functions, the models include capabilities such as temperature measurements and automated data-logging (with the optional PC-interface cable). The U1252A DMM includes a 20-MHz frequency counter and a programmable square-wave generator. Accessories: The U1251A and U1252A DMMs include a range of accessories such as alligator clips; fine-tip test probes; SMT and mini grabbers; and a soft carrying case. The U1253A handheld digital multimeter includes a set of standard test leads and alligator clips. Agilent Technologies’ line of handheld DMMs also includes the U1240 series, which allows users to check with wide measurement ranges, accurate RMS readings and a 10,000-count display. The U1240 DMMs simplify maintenance tasks with harmonic-ratio, dual-temperature and differential-temperature capabilities as well as a built-in switch counter.